Addressing information overload helps your user assistance succeed when knowing your audience and offering correct and concise content is not enough. You can have great topics well-written and well-structured, if they’re part of an information deluge, they won’t help your users get their stuff done. I take my cue from a post by Nathaniel Davis over at UX matters called “IA Strategy: Addressing the Signatures of Information Overload“. Nathaniel describes six such signatures. I think at least three of them have something to say why and how too much information fails in documentation, too. Feedback is the essential reality check to determine whether users suffer from information overload. Customers may report that they’re not sure they’ve found the right information or they cannot apply it efficiently. Even if the content is fine topic by topic, the bulk of information is unmanageable. In this case, consider improving search and browsability for more efficient use of the documentation. The utility gap means that customers only use a small fraction of all the information they have at their disposal. As Nathaniel says, it’s what I have vs. what I use. If all users experience utility gaps, consider progressive disclosure by layering your content. The benefit of offering all content within three mouse-clicks wears off if it’s too much. Progressive disclosure structures content by providing the most essential, most frequently used topics first and more obscure information later. Make sure, however, that all topics remain searchable and findable! Filter failure means that users lack ways to judge which information to trust and use. It’s what I can use vs. what I should use. Filter failure can be solved with tools and with content. Customers who are confident to use their own judgment require tools to filter information. In documentation, faceted search allows users to reduce search results by categories to weed out inapplicable information. Customers who prefer to rely on expert judgement will benefit from recommendations in the content itself. Consider adding such recommendations for certain user roles or use cases to guide customers to the most suitable information. – Have you had symptoms of information overload in documentation? Would these strategies help users to cope? What other solutions are there? Feel free to leave a comment. Breaking down content silos brings benefits and ROI to topic-based authoring, even if you have little or no translation. I’ve cut down time to write and maintain three deliverables by 30-40% by reusing topics. Release notes inform customers about new features and enhancements in new versions. User manuals describe individual modules of the product, how to set them up, how to operate them and what kind of results to expect from them. Online help focuses on reference information for windows and fields, but has some overlaps with information in user manuals. Write release notes in Word. Update or write user manuals in Word. Update the online help in a custom-built help tool that uses Word as an editor and Microsoft’s HTML Help Workshop to publish to Microsoft Compiled HTML Help (.CHM). Copying and pasting worked even better once I structured the content in each of the three silos as topics. For example, a task topic from the release notes would fit almost gracefully among similar task topics in en existing manual. But such manual copy-and-paste reuse is really not efficient or maintainable, because my stuff is still all over the place. I may write in – or copy to – four places, but then remember to update only two of them; enter inconsistency and its twin brother unreliability. To get the full benefits and ROI of topic-based authoring, we’ve found it’s not enough to simply write topics and keep your concepts separate from your tasks. We’ve had to adjust our documentation architecture, our tools and our process. The guiding principle is: “Write once, publish many”. This tech comm mantra proved to be the key. We now aim to have each piece of information in only one topic. That unique topic is the place we update when the information changes. And that’s the topic we link to whenever a context requires that information. 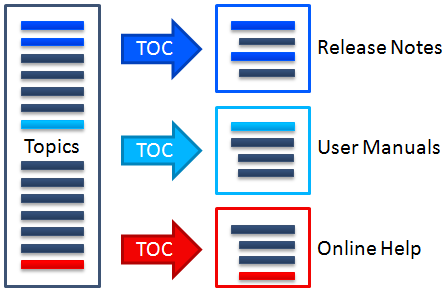 Single sourcing is the best way to get a collection of unique topics into user manuals and online help. So we needed to consolidate our separate content silos into a single repository from which we can publish all our deliverables. MadCap Flare is the tool we chose. It gives us a reliable, yet flexible way to maintain a common repository of topics. For each deliverable, such as release notes and user manuals in PDF and online web help, we simply create a new table of contents (TOC) which collects all topics that go into the deliverable. The writing process has changed considerably: Previously, I would focus on writing a release note entry or a chapter in a user manual. Now I find myself focusing on a specific task or concept and how to describe it as stand-alone content so it works for the user, whether it appears in a user manual or in the release notes. The flexibilities of MadCap Flare’s conditions feature and of our DITA-based information model help us to accommodate the differences of our deliverables. We still write a few topics explicitly for a specific deliverable. For example, in release notes, short “glue” topics serve to introduce new concept topics and task topics to establish some context for the user and explain why a new feature is “cool”. In user manuals, an introductory chapter with a few topics explains what to find where and which sections to read for a quick start. But most of the topics can now be used in release notes, user manuals and online help alike. Since I’ve gone from copy-and-paste in three content silos to single sourcing topics in Flare, the time to write and update documentation for my module has decreased by 30-40%. It’s on the lower end if a new version brings a lot of brand-new features. It’s higher if there are more enhancements of existing functionality. Turning technical communications into a business asset, according to Sarah O’Keefe, is mainly about justifying cost; it is necessary, but possible. Her session at tekom12 was part of the Content Strategy stream, presented as last year by Scott Abel. How expensive is your documentation – really? Much progress in a tech comm department gets stumped when we, the tech writers, say: “Ah, that’d be great – but they’ll never pay for it!” What that really means is: “‘They’ don’t see the value (or the urgency).” So to prove the value behind tech comm, we need to justify how we can either save money (by reducing effort) or how we can generate additional revenue (by producing value that exceeds our cost). Show how tech comm can address legal or regulatory issues. Avoiding lawsuits is a great way to save your employer’s money! Is your documentation efficient to maintain? Does it scale or allow publication in other formats? Does it actually satisfy your customers and support your brand – or does it stab your corporate value statement in the back? Sarah mentioned several strategies to control documentation cost. Reuse as much content as possible: Write once, use many times, either in different places of the same format or in different output formats. Automate formatting: Manually handcrafted formatting of deliverables can be a huge cost factor. It’s not uncommon for tech writers to spend 20% of their time (and hence a sizable chunk of money) on formatting output. Automate this, by relegating format either to templates or CSS. Localization scales content efficiencies: Localizing or translating your content will be all the more inefficient, the more inefficiencies you have in your original documentation processes. This applies to content reuse, inefficient content variants and formatting. Consider whether your documentation is good enough to deflect the maximum possible number of support calls. Anything that users cannot find in the documentation, whether it’s missing or unfindable, drives up costs for your tech support staff. Ensure your documentation content is actually useful to tech support staff: It must not only be accurate, but also up-to-date. Consider the nightmare in terms of costs and maintenance if tech support spun off their own documentation to augment the “official documentation”. Instead, invite them to contribute to the documentation you create. Ensure your documentation is not only searchable (so it’s captured by publicly accessible search engines), but also findable (so people know where and how to get to it) and discoverable (so people link to it, from blogs or forums or twitter or the like). Align tech comm to larger business goals: Find a corporate goal, preferable one that is tied to revenue to be made or cost to be avoided and show: If the tech comm team did this, it could contribute approximately that much money (in savings or additional revenue) to that larger corporate goal. Sarah’s talk was geared towards the strategic angle of tech comm, but succeeded in making valuable points very clearly. Whether you can actually apply her advice in your situation may depend on how much managers with budget control feel the pain of improving tech comm. Linking topics: Cross-reference or relationship table? Choose the appropriate reference type, cross-reference or relationship table, to link between topics so you and your readers get the most from your documentation. When you’re moving from less-than-structured documentation to topic-based writing, one of the less apparent challenges is to link your related topics to one another. You could just keep on using cross-references, but then you’d miss out on some of the benefits of topics. Whether you write topics using a standard like DITA or a tool such as MadCap Flare, you have a new cross-reference type, relationship tables. It is important to distinguish the two types, because each serves a unique purpose. A cross-reference is the link you know from Word or other document-based writing: You create a link to a heading or a bookmark, it can show the heading title, and it updates automatically if that heading (or a page number) changes. If you want to do or know that now, go over there. So far, so good. This kind of link works well, if you have a document with an organised sequence. Occasionally, you need to offer the reader an occasional branching into two alternative secnarios or a jump to another place. But when you convert your content into a pile of loosely connected topics, you have much more demand and more opportunities to relate topics. Disrupt reading flow and orientation. For users, it’s fine to make the occasional choice between scenario A or B. But offering too many links will tempt many users to wonder what they’re missing at the other end. And following link after link from within one topic to the next quickly breaks the flow of tasks and leaves the user confused. Create a web of dependencies. With cross-references, you tie your topics to one another in a certain preferred scenario you engineer. This scenario may not suit the user’s current need. It undermines the flexible “stand-alone” independence of topics that supports multiple use cases. And it makes it harder for writers to reuse them. So while cross-references are easily a preferred way of linking contents in document-based writing, consider carefully how they will affect your use, and the users’ benefits, of your topics. Link to mandatory pre-requisites or required next steps. Link to a series of tasks in an overview/parent topic. In either case, the user pretty much must follow the link to achieve anything useful, so cross-references are fine. Just make sure that the link and the surrounding text are meaningful, so users can decide whether they should follow the link. – So if cross-references are not always recommended, how else can I link between topics? If you’re involved with this topic, you should also be aware of those topics. For users, links from relationship tables appear separately, usually below the actual topic text in a section of related links or “see also”, depending on how you choose to style them. This means that the topics are related as a whole. And they will remain related, even if you update one of them by adding, changing or deleting a paragraph. This is a pretty new concept if you’re used to writing long single documents. And it might feel awkward to have references outside and removed from the linked topics. Keep your topic text flexible. With such a table, you don’t lock your topic into a certain scenario as a cross-reference does. A cross-reference establishes a fixed connection – which might be irrelevant or not even available for certain users or product versions. It’s much easier to drop a topic in a relationship table where it will not appear if it doesn’t exist for certain users or products. Keep your references complete and up-to-date. With tables, it’s much easier to oversee the complete set of links and relationships than with cross-references inside topics. If you’ve ever tried to manually update and rephrase links to a new important topic which has replaced an obsolete topic in countless places, you will appreciate a table where you can simply add or omit any one topic. Relationship tables are not superior to cross-references. They simply serve a different purpose. I hope this post helps you to appreciate the benefits of either type and to decide when to use which. Please leave a comment to let me know if I’ve succeeded or have been wrong or unclear somehow.